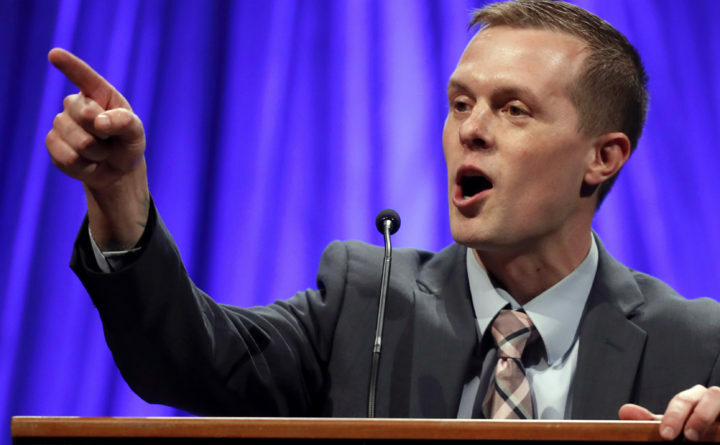 In this May 18, 2018, file photo, State Rep. Jared Golden, the Democratic candidate for Maine's 2nd District Congressional seat, addresses the Democratic Convention, in Lewiston, Maine. STEALING VETERANS BENEFITS: The House has passed the Preventing Crimes Against Veterans Act (H.R. 450), sponsored by Rep. Theodore E. Deutch, D-Fla., to establish a fine and imprisonment of up to 5 years as penalties for those who attempt to defraud military veterans of their veterans’ benefits. Deutch said the penalties “will close a loophole in our criminal law and will give federal law enforcement the tools they need to crack down on financial fraud schemes that target our veterans.” The vote, on Feb. 7, was unanimous with 417 yeas.